A lovely little spot on the south slope of Romeleåsen. 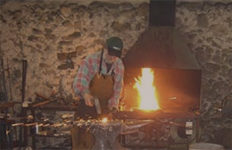 Here we have an blacksmith store with genuine arts and craft. We also have a nice cafe where You can get Coffee or Tea with nice homemade sandwiches and cakes..